A personable mouse who looks after people and knows how to get things done. His friend Cinderella often saves him from the clutches of Lucifer the cat. Ventus helped Jaq make a dress for Cinderella to wear to the ball. His heroic efforts helped free Cinderella after Lady Tremaine locked her in the attic. A girl who believes dreams come true, and her very good friend. "We like you. Cinderella likes you, too. She's nice, very nice. Come on now. Zugk-zugk." Jaq is a character from the Castle of Dreams in the prequel game Kingdom Hearts Birth by Sleep and from Kingdom Hearts Union χ. He is from Walt Disney's twelfth animated feature film, Cinderella. Jaq is first present when Ventus is trapped in a mouse cage and informs Cinderella to rescue him. After he was released, he teams up with Jaq to collect materials in order to make a dress for Cinderella to let her attend the royal ball. When Ven steals a pearl from Lucifer, he gets cornered and Jaq saves him by throwing yarn balls. But the cat knocks him down from the dresser he is standing on and corners him until Ventus comes to his rescue. After the cat's defeat, they are able to make the dress for Cinderella in time and let her dream come true. Jaq and Ven later sit by the window, observing the Castle of Dreams in front of them, discussing their dreams. During Aqua's visit, she gets shrunk to a mouse's size by the Fairy Godmother after Lady Tremaine trapped Cinderella in her room and meets Jaq who is with the key and making his way to Cinderella. When he gets cornered by Unversed, Aqua defends him, allowing him to get the key to Cinderella and free her before the Grand Duke leaves. Some time after the battle at the Keyblade Graveyard, Jaq and the Fairy Godmother watch Cinderella and Prince Charming share a romantic dance from a balcony in the ballroom. 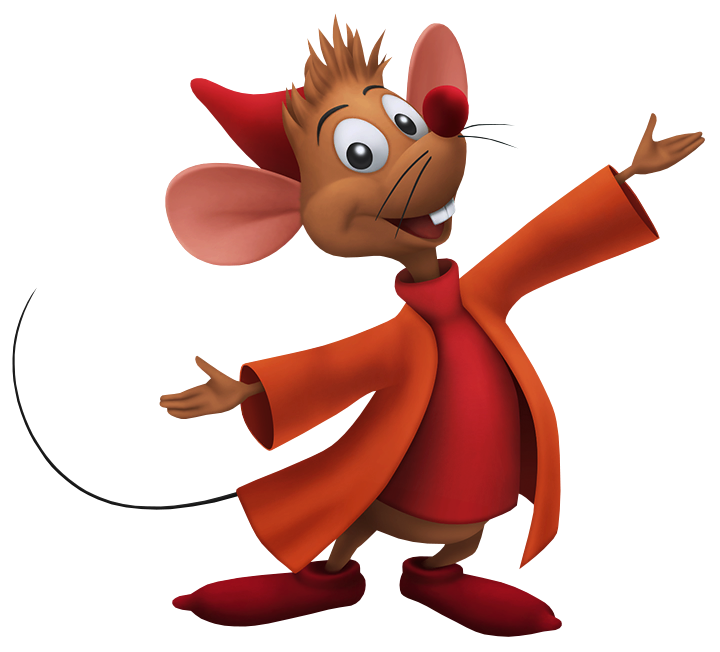 Jaq is a natural leader who takes charge of the mice in Cinderella's care, often taking it upon himself to welcome newer mice to the group, such as Gus. He is extremely clever, and takes great enjoyment in using this cleverness to outwit Lucifer, the cat of the Tremaine household who longs to eat Jaq and his friends. Out of all the mice, Jaq seems to have the strongest relationship with Cinderella; she often monitors his leadership and expects that he keeps an eye on the other mice. Jaq is a small brown mouse with a long tail and two large front teeth. Thanks to Cinderella, he wears miniaturized clothes specially crafted by her for him; Jaq's custom outfit consists of a cap, shoes, shirt and overshirt, which are all shades of red. In mouse form, Jaq has a noticeably high-pitched voice to suit his small stature. In addition, Jaq and his mouse friends occasionally let slip a minor speech quirk, referring to Cinderella as "Cinderellie" and Lucifer as "Rucifie". Although Jaq's abilities in Kingdom Hearts Birth by Sleep are not fully displayed, in the film, he is shown to be clever and stealthy, traits which help him during his constant run-ins with Lucifer. Being a mouse, he can also access tight spaces and areas not accessible to humans. Jaq first appears in Walt Disney's film classic film, Cinderella. The film was, in turn, inspired by the Charles Perrault fairy tale, Cendrillon, which was published in 1697. In Perrault's tale, the mice were only included with the purpose of being turned into horses for Cinderella's carriage. For the film, the mice's roles were expanded, turning them into friends for Cinderella, and some of them were given distinct personalities; thus, Jaq became the lead mouse. Also, in the film, Jaq is constantly seen partnered with his best friend, Gus, a fatter and slower mouse who is equally as brave and loyal to Cinderella. Jaq was the first new Disney character featured in promotional pictures and footage of Kingdom Hearts Birth by Sleep. The fast-paced, high-pitched, unintelligible language spoken by Jaq in Cinderella was dubbed "Mouse Latin" by Disney story man Winston Hibler. Because Jaq's use of the language was carried over into Kingdom Hearts Birth by Sleep, subtitles that appear on the screen do not match what he actually says. However, there are some instances where this occurs, such as when he speaks to Ventus in a mouse trap and uses his trademark phrase, "Zugk-Zugk". Ironically, if Ven returns to Castle of Dreams and speaks to Jaq in Cinderella's Room, Jaq's dialogue in the text boxes are spelled exactly as how he says it; for instance, "Ven-Ven" and "Flinderelly" are used.